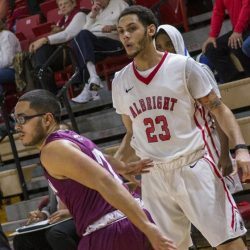 ANNVILLE, Pa. – Albright men’s basketball senior DeJuan Smith led the Lions to a 2-0 start in conference play while averaging 20.5 points, four rebounds and 3.5 assists per game. For his efforts in last week’s two home victories, Smith was named the MAC Commonwealth Men’s Basketball Player of the Week. Smith also shot 59 percent (16-of-27) from the field and 45 percent (5-of-11) from long range. Smith scored 22 points on 8-of-15 shooting with three rebounds, three assists, a block and a steal in an 81-77 win over Stevenson. The senior then scored 19 points on 8-of-12 shooting with five rebounds, four assists and a steal in a 73-57 win over Arcadia. Albright stays in MAC Commonwealth action on December 6 when it travels to Widener at 6 p.m. The Lions return home on Friday night against Franklin & Marshall. Tip-off is set for 7 p.m.